We present an adversarial domain adaptation based deep learning approach for automatic tumor segmentation from T2-weighted MRI. Our approach is composed of two steps: (i) a tumor-aware unsupervised cross-domain adaptation (CT to MRI), followed by (ii) semi-supervised tumor segmentation using Unet trained with synthesized and limited number of original MRIs. We introduced a novel target specific loss, called tumor-aware loss, for unsupervised cross-domain adaptation that helps to preserve tumors on synthesized MRIs produced from CT images. 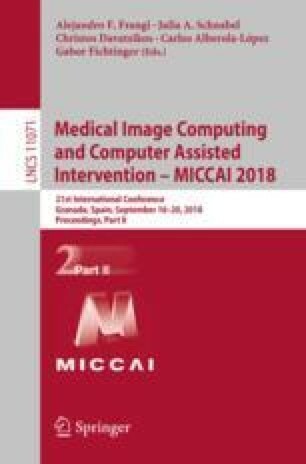 In comparison, state-of-the art adversarial networks trained without our tumor-aware loss produced MRIs with ill-preserved or missing tumors. All networks were trained using labeled CT images from 377 patients with non-small cell lung cancer obtained from the Cancer Imaging Archive and unlabeled T2w MRIs from a completely unrelated cohort of 6 patients with pre-treatment and 36 on-treatment scans. Next, we combined 6 labeled pre-treatment MRI scans with the synthesized MRIs to boost tumor segmentation accuracy through semi-supervised learning. Semi-supervised training of cycle-GAN produced a segmentation accuracy of 0.66 computed using Dice Score Coefficient (DSC). Our method trained with only synthesized MRIs produced an accuracy of 0.74 while the same method trained in semi-supervised setting produced the best accuracy of 0.80 on test. Our results show that tumor-aware adversarial domain adaptation helps to achieve reasonably accurate cancer segmentation from limited MRI data by leveraging large CT datasets. The online version of this chapter ( https://doi.org/10.1007/978-3-030-00934-2_86) contains supplementary material, which is available to authorized users. This work was funded in part through the NIH/NCI Cancer Center Support Grant P30 CA008748.